Боуи хушаматлă урăх çынсем çинчен Википедире статьясем пур. Дэ́вид Бо́уи (акăл. 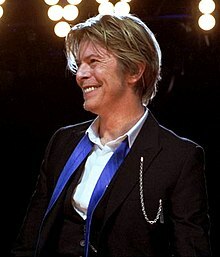 David Bowie) [ˈboʊ.i] (сăн ячĕ Дэ́вид Ро́берт Джонс (акăл. David Robert Jones); кăрлач, 8 1947, Брикстон, Ламбет, Лондон, Англи — кăрлач, 10 2016, Манхэттен, Нью-Йорк, Нью-Йорк, АПШ) — британ рок-юрăç тата хăйĕн юррисене шăрантараканĕ, çаплах продюсер, сасă режиссёрĕ, ӳкерçĕ тата актёр. ^ Pareles, John. Review/Rock; For Bowie, One More Change of Pace, The New York Times (30 November 1991). Тĕрĕсленĕ 2 Чӳк уйăхĕн 2008. ^ How to say: Bowie. Magazine Monitor. BBC News (8 January 2008). çăлкуçран архивланă 26 Çурла уйăхĕн 2011. Тĕрĕсленĕ 22 Чӳк уйăхĕн 2008. ^ The Times 8 January 2010. Retrieved 9 January 2010. ^ Monroe, Jazz David Bowie Reportedly Releasing New Album Blackstar in January. Pitchfork (24 октября). Тĕрĕсленĕ 25 Юпа уйăхĕн 2015. Buckley, David. David Bowie: Complete Guide to His Music. — Omnibus, 2004. Picaud, Loïc. David Bowie et le rock dandy. — Hors-Collection, 2007. Robin, Pierre. David Bowie: Du provocateur au séducteur ultramoderne. — Paris: B. Giovanangeli, 2005. — 252 p. — ISBN 2-909034-76-3. Sanford, Christopher. Bowie: Loving the Alien. — Da Capo Press, 1998. Seabrook, Thomas Jerome. Bowie in Berlin: A New Career in a New Town. — Jawbone Press, 2008. Soligny, Jerome. — David Bowie. Spitz, Marc. Bowie: A Biography. — Crown Publishers, 2009. Thompson, Dave. — Hallo Spaceboy: The Rebirth of David Bowie. — Ecw Press, 2006. Tremlett, George. — David Bowie: Living on the Brink. — Carroll and Graf, 1997. Ungemuth, Nicolas. — David Bowie. — Librio, 1999. Waldrep, Shelton. Phenomenology of Performance // The Aesthetics of Self-Invention: Oscar Wilde to David Bowie. — University of Minnesota Press, 2004. Welch, Chris. David Bowie: We Could Be Heroes: The Stories Behind Every David Bowie Song. — Da Capo Press, 1999. Wilcken, Hugo. 33⅓: David Bowie’s. — Low, Continuum, 2005. Moonage Daydream: the life and times of Ziggy Stardust; photos by Mick Rock — textes by David Bowie. — Genesis Publications, 2002. Ку страницăна .юлашки хут хӑҫан улӑштарни: 17 Çу уйăхĕн 2017 08:46.